Android tablets are great, but they never quite seem to hit the heights set by the Apple iPad — neither in terms of build quality, weight, responsiveness, nor general versatility. In an attempt to change this, Google has released the Pixel C tablet (along with a choice of expensive keyboard covers), which it hopes will paint the Android tablet experience in a whole new light. 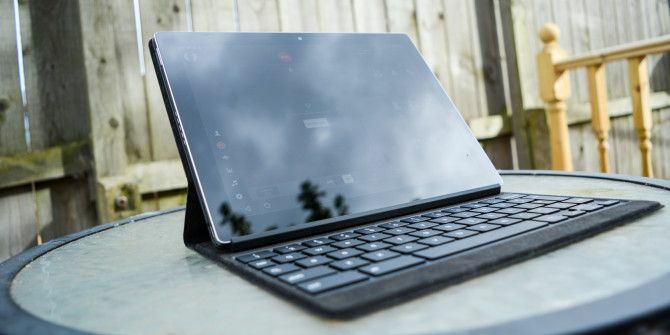 But are they successful in this, or is the whole idea just academic in a world with affordable Windows 10 tablets Acer Switch Alpha 12 Hybrid Tablet Review Acer Switch Alpha 12 Hybrid Tablet Review Looking for a better priced Surface Pro 4? The $600 Acer Switch Alpha 12 offers 90% of a Surface Pro, at almost half the cost. Read More and Chromebooks? It’s currently available for $499 directly from Google (plus another $150 for the keyboard). I’m proud to report that the Android tablet scene was one of the few times I’ve ever had my finger on the pulse (I don’t count using a smartphone from 2003-2008 because, well, it was a Windows Mobile device). Back in 2010, when the first Android tablets were released, I headed to my local electronics store and bought an Advent Vega tablet (also known as the P10AN01), rooted it, and discarded the version of Froyo that game pre-installed. I then installed a custom Android Honeycomb ROM called VegaComb. Despite the low cost of the device, it was reasonably good, but struggled with certain tasks (such as audio processing), where the iPad would shine. This was partly down to the operating system, as well as the architecture. But why do I mention the Advent Vega in particular? Well, it’s because the processor on that device was a dual core Tegra 2. The Pixel C also features a Tegra processor, this time the octa-core Tegra X1. But how does this measure up? Six years is a long time in technology. Google’s Pixel C tablet takes a powerful Tegra X1 system-on-chip processor with 3 GB of RAM (32 GB or 64 GB of non-expandable storage is included, depending on the price point) and produces what is perhaps the best Tegra-powered tablet outside of NVidia’s gamer-centric Shield range NVIDIA Shield TV Review NVIDIA Shield TV Review The proposition is simple: Pack some of today’s best performing mobile hardware into a sandwich shaped box – for streaming video and media, and playing mobile games. That’s why you need to pay $200-300. Read More . The processor uses the curiously named ARM big.LITTLE architecture, which means that four of the eight cores are slower and power efficient, while the other four are faster and more powerful. This allows for more efficient battery usage when performing simple tasks like web browsing, with the ability to ramp up for more demanding task like gaming. The 10.2 inch, backlit LTPS IPS LCD display, runs at 308 ppi (density 2560 x 1800), and is powered by the 256-core Maxwell GPU. Weighing in at 18.2 oz (517 g), the 9.53 x 7.05 x 0.28-inch (242x179x7 mm device sits comfortably in the hand in either orientation, and the narrow bezel enhances the idea of the tablet as an iPad-beater. Over time it can be tricky to hold, however, partly due to the sleek quality of the build. The Pixel C comes with all of the usual cameras (8 MP rear, 2 MP front), audio (3.5 mm combo headphone/microphone jack, dual side-facing speakers) and connectivity options (WiFi, Bluetooth). NFC is conspicuous by its absence, as is a 4G variant of the Pixel C, which would no doubt see the tablet do well with the mobile networks. Where Is the Pixel C? This does seem to be a bit of a problem for Google’s flagship Android tablet, the successor to the Nexus tablets, at least for now. Unless you’re buying online from Google Play or Amazon, or from big name retailers, you’re not going to see much of it. Similarly, it has been largely absent from TV and magazine advertising, a sure-fire means of getting your product seen. Given the sheer chasm in quality and performance between the Pixel C and tablets from rival Samsung, this is lunacy. But most importantly, I feel, is the lack of partner deals with smartphone retailers. A 4G version of the Pixel C was touted early on, but this has failed to materialize. Is it a Tablet, a Laptop, or a “Laplet”? Yes, I really did just say “laplet” — it’s a terrible concatenation of “laptop” and “tablet” — and while it tries desperately to describe a device like the Pixel C (or perhaps Microsoft Surface Pro 4, or Apple iPad Pro) all it does really is trivialize the fact that this is a powerful, versatile tablet. The Google Pixel C is not a laplet. Not really. It most certainly isn’t a laptop — it feels and operates like a tablet. It doesn’t come with a mouse or touchpad (although Bluetooth devices can be added 6 Top Uses For Bluetooth On Your Android Phone 6 Top Uses For Bluetooth On Your Android Phone Bluetooth has been an impressive wireless technology to enable all sorts of cool functionality with multiple gadgets. While it was rather limited during the early stages of its life, Bluetooth has evolved to be capable... Read More ), an optical drive or even a card reader. None of the things you would expect from a laptop are included, and placing the device on your actual lap is clumsy and unwieldy. So the Google Pixel C is definitely a tablet. But how is it to use? Both of Google’s approved keyboard options for the Pixel C will set you back over $100. The one we’re featuring in this review and giveaway is a folio option that features a useful magnetic strip to keep the tablet in place. While there’s no “choose your own angle” adjustable stand as with the Surface Pro 4, it does offer two viewing angles, which is obviously better than just one. This keyboard will wrap around behind the Pixel C to allow its use in portrait mode, and actually makes the tablet easier to hold. I’d like to say that the keyboard is good enough for me to have written this entire review on. But circumstances happen; as a result, some of it was written on the Google Pixel C (along with several other complete posts, such as my look at Android Trojan infections How to Avoid Downloading Trojans to Your Android Device How to Avoid Downloading Trojans to Your Android Device Trojan attacks are sneaky because they can steal your personal details and sensitive data without you even realizing it. Here's how to avoid Trojan infections on Android devices. Read More ). If you’re buying a Pixel C, you may prefer to buy the tablet and couple it with your own Bluetooth keyboard. Whatever your solution, we’d recommend some sort of folio case regardless, as the Pixel C isn’t easy to grip. One of the key selling points for the Google Pixel C is that it is a production tablet. Attach a keyboard it really does work like a compact ultrabook, much like Apple’s iPad Pro Powerful Things, Small Packages: iPad Pro 9.7" Review Powerful Things, Small Packages: iPad Pro 9.7" Review For some people, a 12.9" screen is the main draw of Apple's first iPad Pro. For others, size was the main barrier to entry. Read More and Microsoft’s Surface Pro 4 Surface Pro 4 Review Surface Pro 4 Review If you’re looking for a flexible portable hybrid computer, one that is capable of replacing your notebook and iPad or Android tablet, the Surface Pro 4 Core M3 device is a perfectly adequate replacement. Read More . With Google’s “pure” Android installed, everything works well, and app switching is swift. This is particularly useful when it comes to running multiple apps (perhaps a browser and a word processor) and with the windowed mode in the Android N upgrade Everything You Need to Know About Android N Everything You Need to Know About Android N Want to install Android N or just learn about the next Android version? We've got your back. Read More , it’s bound to deliver even more of a productive desktop experience. But, as you should be aware, so many creative and productive apps are now available for Android. A device like the Pixel C is perfect for taking advantage of these tools and getting down to business. Of course, all of this depends really on what sort of experience you want from your Android tablet. For instance, I usually use a Samsung 10-inch tablet, but even with a custom ROM installed this is a clunky experience, best for enjoying things like Comixology, Readly and Kindle, rather than doing any real work. If this is how you typically use a tablet, you might find that the Pixel C is a slightly expensive option. After all, these apps are available and run sufficiently well on nearly any device you can get hold of these days. Spending the best part of $600 on Google’s flagship tablet and accompanying keyboard, simply to enjoy the same reading experience with a slightly better display, seems excessive. On the other hand, if you want to read and research as well as be productive, the Pixel C is perfect. Photo editing, video editing, even podcasting, are all tasks you can perform on the Pixel C. While this is not unusual for Android devices these days, the processor and RAM make these activities particularly slick and enjoyable, without the typical lag associated with older devices and Android versions. Enjoying games, photos, streamed video and music and any other content you can think of is similarly impressive. The color reproduction of the 10.2-inch LCD display is superb, with a richness to games and videos, a crispness to photos. Android’s iPad Killer Has Finally Arrived! While it’s a little heavier than an iPad, the Pixel C feels a little more businesslike, and it certainly has the muscle to provide all but the most ardent power users with all of the tools they need to get the job done. I’ll be honest: I’ve been evaluating this tablet for two months now. It is simply the best I’ve used of this type of device, and I’m very sad to see the back of it. Of course, $800 once you include the keyboard (or £700) isn’t cheap — but this isn’t a low grade media tablet. Forget every Android and iOS tablet you’ve used before, ignore all of the competition, and buy this. Especially if it is ever available from a mobile network! Count Me in :) I would really love to have google pixel c tablet . Dear team, waiting eagerly for Giveaway results. how to the video code on Youtube? The hardware may be impressive for multimedia & gaming but it is as weak as the weakest link in the package - the operating system. I wasn't impressed with the Nexus & I'm not too impressed with this. Windows has a real file system & real multi-tasking, Android comes close but misses the mark. I'm relatively new to this site... how do I enter the giveaway? My coworker has this combo and he loves it. Would love to win this. Looks nice for what it's meant to do. I've had one of these for over a year now. Glad to see someone else who thinks as much of this as I do. I've loved my Pixel C from the moment I've had it, and prefer it to the iPad, which I have at work and my wife has. If you get the hard case keyboard instead of the leather backed one, if you have issues with the leather one. I prefer the hard case one. It allows you to hold the device by the keyboard without the worry of dropping it. I believe this is as good if not better than an iPad and is purely down to your OS preference. I prefer Android over iOS. And the only think that makes this more practical than an iPad is the very awesome keyboard. Android N and split screen are just a recent bonus. The button to follow on LinkedIn isn't there. Calling this an iPad killer is a bit of a stretch. Android may be a better OS, but iPad's hardware is better and all the innovative developers develop for iPad. iPad has low latency audio, GarageBand, micro-fluid keyboard case, active stylus with pressure sensitivity and palm rejection, time-synced multimedia notes, and hopefully 3D touch will come soon as well. At the end of the day an Android device is just another smartphone, but iPad is a complete workstation.